Down..set..hike! 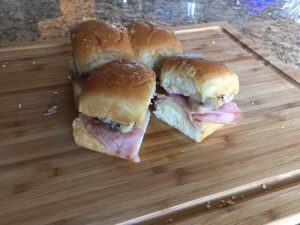 Get your team pumped with these yummy sliders! I am so excited for it to be football season again! And with football season comes tailgating and all the treats that go with! Not only is it a great way to get everyone to gather around over a fun sporting event (or any event), it is also a great time to try a twist on a classic recipe on a very hungry crowd. When it comes to tailgating food, my rules are that it needs to be portable and shouldn’t make too much of a mess. These perfect little sliders are a great spin off of the classic Cuban sandwich and are sure to please whatever crowd you may be feeding.